To make the dough, combine milk and yeast in the bowl of a stand mixer fitted with a hook; let it sit until foamy, about 10 minutes. Stir in sugar, melted butter, 1 teaspoon salt, and egg; add flour, and mix on low-speed until dough forms. Increase speed to medium-high; knead until smooth, about 8 minutes. Cover with plastic wrap; let sit until dough doubles in size, about 1½ hours. Meanwhile, beat the softened butter, brown sugar, and zest in a bowl on high-speed of a mixer until smooth, about 2 minutes. Add remaining ½ teaspoon salt, confectioners’ sugar, and extracts; beat until smooth, about 2 minutes. Transfer ¼ cup filling to a bowl; stir in juice to make an icing. Set filling and icing aside. Transfer dough to a work surface; using a rolling-pin, roll dough into an 18″ × 10″ rectangle, and spread filling evenly over dough. Lift up bottom edge of dough and roll it into a log; trim ends and cut log into 12 rounds. For smaller buns, cut the log into about 16 rounds. Transfer rounds cut side up to a greased 9″ × 13″ baking dish; cover with plastic wrap. Chill 6 hours or overnight. Heat oven to 375°. Uncover rolls and bake until golden brown, about 25 minutes. 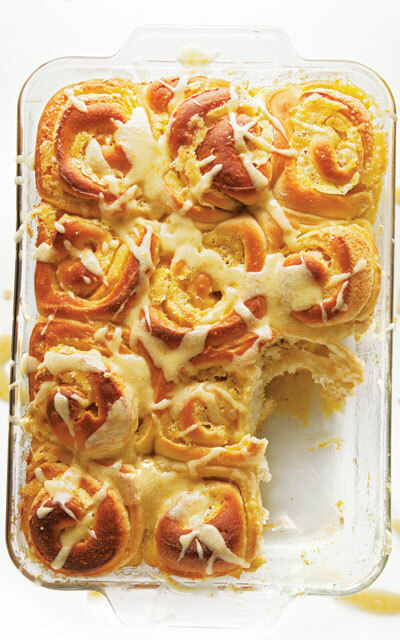 Drizzle icing over rolls before serving.